There are some amazing cities in Virginia, with some even better 55+ communities to check out nearby. Virginia has long been a retirement destination for those seeking a comparatively mild climate, especially when compared to the blustery East Coast and sweltering Florida. The landscapes are breathtaking and vary widely. The state has the rolling Blue Ridge Mountains in the west and the Atlantic Coast to the east. The state also offers affordable homes and tax benefits, with the median home price being just a hair over $200k and an average combined tax rate of just 5%, making it one of the most affordable places in the country to live. 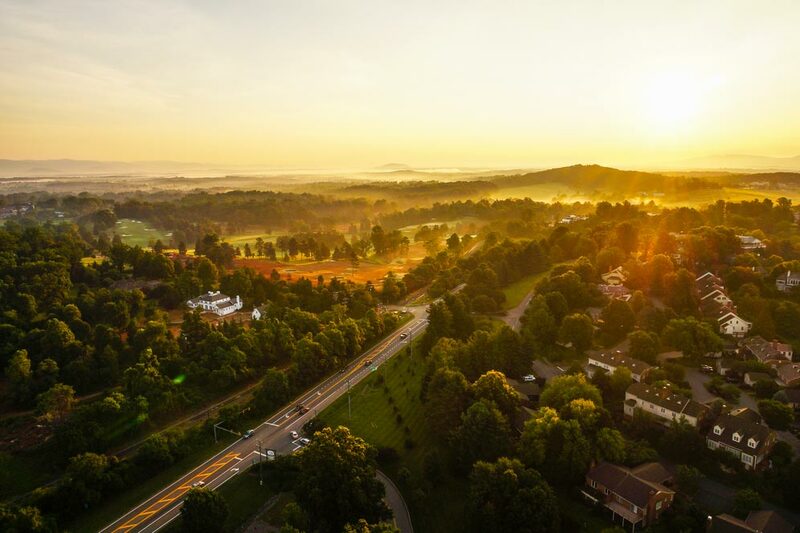 These benefits are not limited to merely rural areas in the state either, city-seekers will find several bustling, affordable cities to call home in the State of Virginia, including Charlottesville, Richmond, Fredericksburg, and Virginia Beach. With a population of roughly 260,000 people, Richmond ranks as the fourth most populous city in Virginia, and has all the offerings of a bustling metropolis. Richmond has a rich, distinctly academic history, making it the perfect spot for retirees looking for a place that will continue to challenge and excite them throughout their Golden Years. The city hosts the Virginia Commonwealth University, with the area around it being one of the most architecturally diverse regions in the state. The university offers continuing education classes for learners of all ages, making for a great spot to learn a new skill or expand your knowledge. There are also numerous museums to explore, including the Virginia Historical Society, Virginia Museum of Fine Arts, and the Virginia Center for Architecture—where you will find examples of some of the wide-ranging architecture offered throughout the city, including Georgian and Greek Revival. In addition to its historic roots in art and politics, however, Richmond is also rooted firmly in the present with its hugely popular presence of murals and other forms of street art. The city hosts the Richmond Mural Project and the RVA Street Art Festival, drawing in internationally acclaimed artists from around the world. Much like Richmond, Virginia Beach is a popular city in Virginia. However, while the city is home to nearly half a million people, and hosts several world-class museums and cultural activities, retirees will also find nearly 210 city parks, encompassing over 4,000 acres, and what the Guinness Book of World Records considers the “longest pleasure beach in the world”, where you will find some of the best surfing on the east coast. Retirees will have the best of both worlds in terms of outdoor recreation and culture, as Virginia Beach is widely known for being a cultural powerhouse in the state. Of the many historic, scientific, and artistic offerings in the city, one of the most popular is certainly the Virginia Museum of Contemporary Art, featuring an impressive collection of photography, glass, video, and other visual media. Nearby, you will also find the Edgar Cayce hospital for Research and Enlightenment, an eccentric spot that features a massive private library open to the public and massage therapy sessions available by appointment—the perfect place to kick back and relax! For those looking for a city truly steeped in American history, look no further than Fredericksburg. Fredericksburg lies just 45 miles south of Washington, D.C. and is host to hundreds of preserved heritage sites within its borders. The city rests at the intersection of the Rappahannock River and the Atlantic Seaboard Fall line, which made the city a prominent port during colonial times, which allowed the city to grow into the prominent and bustling city it is today. Fredericksburg boasts a 40-block historic district, containing more than 350 buildings dating back to the 18th and 19th centuries, including the home of George Washington’s sister and mother during the later years of his life. Other important sites include the 1852 courthouse designed by the architect James Renwick of the famed St. Patrick’s Cathedral in New York, and the James Monroe Museum Library. In addition to the beautiful historical element of Fredericksburg, the city boasts a mild, four-season climate making it the ideal spot for outdoor recreation year-round. Residents are often found kayaking on the river, or relaxing in one of the several public parks. Although Charlottesville is among the smaller cities in Virginia, it offers a wide range of attractions in and out of the city that keep residents occupied and engaged. Affectionately known as “CVille” among locals, the city offers a long list of attractions and venues, including wine and beer tours at CVille Hop on Tours, hiking, and world-class entertainment performed at the large local arena, the Spring Pavilion. Downtown hosts the Paramount Theatre and the Lyric Theatre, where Boomers can enjoy theatre and music, and the city is also host to the annual Virginia Film Festival in October, drawing filmmakers and watchers alike from throughout the country. In addition to inner-city entertainment, Boomers will love having quick access to the nearby Shenandoah National Park, which offers plenty of recreation and beautiful scenery with rolling mountains and many hiking trails to stay fit. For those who want to leisurely enjoy nature, the park possesses the magnificent Skyline Drive, a scenic drive that runs the length of the park. It is impossible to make the wrong decision in choosing a city in Virginia. Each city offers a wonderful combination of urbanity, history, and outdoor space, their own take on the arts, and of course, charming active-adult communities. Look no further than Virginia when considering your next adventure!